We all dread going to the grocery store. The parking, the lines, the carts that never have fully functioning wheels… it’s all just one big hassle, not to mention our struggle in the produce section. We can’t find any jalapenos; the greens are wilting in their packaging like debutantes on a hot summer day and all the tomatoes are bruised from someone squeezing them for ripeness. Isn’t there a better way to get fresh, healthy produce? Yes, and hydroponics is the answer. We live in an exciting time when growing one’s own food has never been easier. The sheer number of resources one can find on hydroponics, thanks to our friends at Google and YouTube, is staggering. Or if you prefer a personal touch, you can talk to experts at the numerous local nurseries and farmer’s markets around town. They all make it look so easy! Hydroponics typically produces superior crops with fewer pest problems, using less water in a shorter period of time than conventional growing in soil. And you don’t have to sacrifice quality for price. Therefore, many people out there are raising the question, “If they can do it, why can’t I?” Well, you can! But first, question if you should. Before diving in head first, start by asking “How much do I actually spend on produce?” Now I’m not here to fear monger that healthy eating is expensive. The simple fact is that cost is not measured only in dollar signs. One must also consider time, convenience and space. Perhaps a better way to put it is, “Is it worth it to me?” It would be a terrible shame to start zealously only to be overwhelmed by the effort required or discouraged by low yield. Growing at home is a hobby, not just a source of cheap bell peppers. 2 Gallon Reservoir includes grow media, air pump and tubing, 6 planters, seed starter cubes, molded cover, pH test kit, and nutrients. Hydroponics has a high initial cost, but pays for itself over time. So if you’re a college student only buying 1 bag of carrots every 2 weeks to put in your ramen noodles, it probably isn’t cost effective for you. Yet when buying produce (canned, fresh, or frozen) more than once a week, it may be worth it to you to make the switch. Whether or not you’re vegetarian, you could significantly reduce your annual food cost. When in doubt, try thinking of it in terms of a full year. For example, you buy 1 package of lettuce each week at $7, spending $364 a year. A small deep water culture system might cost $40-$70 upfront (plus $2 for seeds), but you could grow several crops with up to 6 heads of lettuce at a time, costing less than $100 a year. Besides, containers, irrigation and even certain growing media can be reused year after year. One of the most common mistakes new growers make is believing they can go from buying fresh to only growing their own instantaneously. But hydroponics requires planning and patience. Waiting for your crop to be ready is not for the faint of heart. It could be weeks or even months before you harvest anything. And that time will require care. It is typically recommended that you change/adjust the water in your hydroponics system every 7-14 days, and you should check your plants every day or every other day to prevent sudden changes or problems. Consider what time you are willing to devote to your project. Lastly, you do not need a full-sized greenhouse in order to grow hydroponically at home, but you do need at least a little space. Base your decision on the yield you want. A few 6-8” pots in the kitchen is sufficient for herbs. If that’s not enough, the spare closet will have you giving cucumbers away by the pound. Still want more? A larger grow tent in the garage can house a lemon tree. For even more….well, maybe just build a greenhouse. Just remember, the greater the yield desired the more plants you will need and therefore, the more space. Hydroponics may not be for everyone, but for those who can the rewards are great. If you are willing to put in the time and effort, you can have your favorite herbs and veggies readily available year round. You may not be able to completely cut out the grocery store, but you will reduce the amount of time and money spent there. And isn’t that worth it? Get started with a prebuilt hydroponic system or design your own. Not sure which supplies work best for your project? 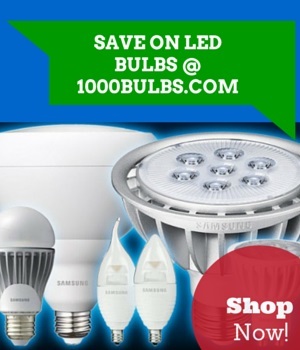 Leave us a comment below or email socialmedia@1000Bulbs.com. Our on-staff horticulture expert is here to help turn your thumb into a green one.